Towbar Express. Professional Mobile Towbar Fitters. In 1997 Towbar Express was founded to provide a high quality mobile towbar fitting service. Initially we only covered North Yorkshire with just one van. This quickly became 2 vans with one covering the Humberside area. Our fleet has steadily grown since. 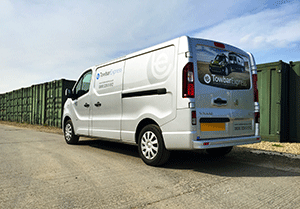 Fast forward to 2015 and we now cover 85% of Britain, and we are working hard adding more fitters and vans to our fleet all the time. We are now celebrating over 20 years in business! You can check if we cover your area here. Unlike other companies who claim to cover a large area, our fitters are directly employed by us, we do not contract out any work to other companies, nor do we franchise out our network. This means that you won't find yourself buying the towbar from one company, then arranging with another company to fit it. You certainly won't find yourself dealing with an independant franchisee, or chasing someone on their mobile phone. All calls come to our head office, where our experienced sales team can help and advise, and organise the best possible towbar solution for you. From start to finish we take care of everything. For 2015 we have completely re-thought how we work, we've developed this eCommerce web site to make it as convenient as possible for you to make a booking, and we decided to retire our old logo which was 'designed' on the back of an envelope in 1997! Time for a much needed re-brand. One thing that hasn't changed is that Towbar Express is still a family run business with the same people that founded the company. We still have a strong commitment to bring you only the very best products and service that you've come to expect. It has never been our aim to be the 'cheapest' towbar fitting company. There are plenty of towbar companies out there competing to cut corners and be the cheapest, that's not what we do. Our aim is to offer a high quality convenient serivice using only high quality parts. With over 20 years in business we specialise in nothing but tow bars, and have fitted 10's of thousands of them around the country, to all makes and models of vehicles. Our knowledge and experience is unrivalled, meaning that we can offer the very highest standards of service and installation.